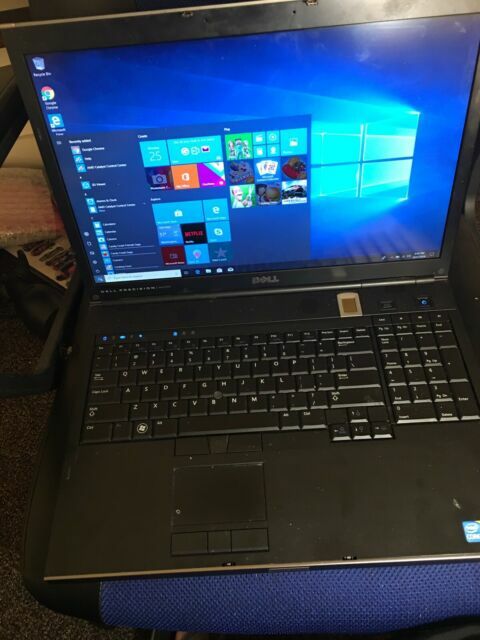 Great and powerful Dell precision M6500 Q720 intel core i7 with 640GB hard drive, 8GB RAM with dual core 1.6ghz processor, windows 10 professional plus Microsoft office and lots more! Item Description Dell Latitude E6520 Business Notebook.Office 2013 Installed. Only Notebook and AC Charger (NO Box, NO Software CD's or other Accessories). item 4 Dell Precision M6500 17in. Notebook/Laptop - Engineering Based LOADED! -Dell Precision M6500 17in. Notebook/Laptop - Engineering Based LOADED! This is the best all around laptop available from any manufacturer. Excellent build quality, easy to upgrade and many many upgrades are avail. CPU, ram, video cards etc It is heavy no doubt, but the newest laptops bend, twist and have a "flimsy" feel. This laptop is a tank. I recently returned a brand new Inspiron 17 b/c of the cheap interfaces (keyboard, touchbad) and the slow computer. But this thing rocks - even though it's from Dec, 2010. Of course, back then it cost $2400 new. I might add that I wanted a 1920x1200 screen (instead of a 1920x1080) b/c I look at stock charts. It makes a huge difference. Works at a desk but heavier than I thought.